^ a b c d e f g h i j k Charming, C.; Bourgoin, S. (2009). Knack Bartending Basics. Knack: Make It Easy. Globe Pequot Press. pp. 72–73. ISBN 978-1-59921-772-7. https://books.google.com/books?id=AJKr67ceXpMC&pg=PA72. ^ a b c Hellmich, M. (2010). The Ultimate Bar Book. Chronicle Books. p. 320. ISBN 978-0-8118-7290-4. https://books.google.com/books?id=q43NAVAcIAkC&pg=PA320. ^ Aikman-Smith, V.; Lehr, R. (2015). Juicy Drinks. Weldon Owen. p. pt96-97. ISBN 978-1-68188-008-2. https://books.google.com/books?id=KortCQAAQBAJ&pg=PT96. ^ a b Stewart, M. (2015). Martha Stewart's Appetizers. Potter/TenSpeed/Harmony. p. 496. ISBN 978-0-307-95463-3. https://books.google.com/books?id=xGvWBQAAQBAJ&pg=PA496. ^ Gisslen, W. (2004). Professional Baking. Wiley. p. 38. ISBN 978-0-471-46427-3. https://books.google.com/books?id=YrQZi41PqKEC&pg=PA38. ^ Algood, T. (2013). In a Snap!. Thomas Nelson. p. 116. ISBN 978-1-4016-0487-5. https://books.google.com/books?id=4OSpl7yKfxcC&pg=PA116. ^ Rivard, D. (2009). The Ultimate Fruit Winemaker's Guide: The Complete Reference Manual for All Fruit Winemakers. Bacchus Enterprises Winemakers. Createspace Independent Pub. p. 49. ISBN 978-1-4414-5092-0. https://books.google.com/books?id=ciZNkmsLETYC&pg=RA1-PA49. ^ Carole Bloom, CCP (2007). The Essential Baker. John Wiley & Sons. p. 5. ISBN 978-0-7645-7645-4. https://books.google.com/books?id=cyR9VsqMvJsC&pg=PA5. ^ Ruth, J.; Caruso, M. (2002). Mix It Up!. Chronicle Books. p. 53. ISBN 978-0-8118-3479-7. https://books.google.com/books?id=32uJSUUCHykC&pg=PA53 2015年12月12日閲覧。. ^ a b c McDonnell, D.; Abiol, L. (2015). Drinking the Devil's Acre: A Love Letter from San Francisco and her Cocktails. Chronicle Books. pp. 185–186. ISBN 978-1-4521-4062-9. https://books.google.com/books?id=zSnICAAAQBAJ&pg=PA185 2015年12月12日閲覧。. ^ a b Abou-Ganim, T.; Faulkner, M.E. ; Turner, T.; DeGroff, D. (2013). Vodka Distilled. Agate Publishing. pp. pt99-100. ISBN 978-1-57284-712-5. https://books.google.com/books?id=Ey2sCdQ6gzUC&pg=PT99 2015年12月12日閲覧。. ^ Solomon, K. (2014). Jam It, Pickle It, Cure It: And Other Cooking Projects. Potter/TenSpeed/Harmony. p. 385. ISBN 978-1-60774-769-7. https://books.google.com/books?id=fCI4AwAAQBAJ&pg=PA385. ^ Haasarud, K.; Grablewski, A. (2014). 101 Shots. Wiley. p. 12. ISBN 978-1-118-45673-6. https://books.google.com/books?id=VBlOAwAAQBAJ&pg=PA12. ^ Charming, C.; Bourgoin, S.. Just Martinis: A Little Book of Liquid Elegance. Globe Pequot Press. pp. 64–68. ISBN 978-0-7627-6298-9. https://books.google.com/books?id=GCJzF4slNHgC&pg=PA67. 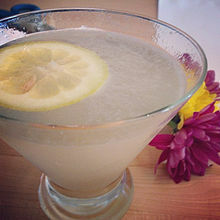 Lemon Drop Martini Recipe. About.com.